When it comes to our impact on the environment, we recognize that what we do today will matter tomorrow. Guided by our Serving Responsibly commitment, we actively work to make business decisions that serve the interests of our guests, franchisees, communities and the planet today and for years to come – by reducing our packaging, improving the efficiency of our restaurants, and sourcing our ingredients more sustainably. At Dunkin’ Brands, we are always looking for opportunities to make improvements to our packaging that make sense for the planet and for our business. To this end, we evaluate our packaging on an ongoing basis with suppliers and discuss opportunities to decrease the amount of material in our packaging; increase the amount of recycled and/or certified material in our packaging; and find packaging options that are recyclable, compostable, biodegradable or a combination of those. In February 2018 we announced our plans to eliminate all polystyrene foam cups in our global supply chain beginning in spring 2018, with a targeted completion date of 2020. In our U.S. restaurants, we will replace the foam cup with a new, double-walled paper cup. The majority of Dunkin’ international markets are currently using paper cups, and we will work with our franchisees to eliminate foam cups from the remaining international markets by the 2020 goal. The move complements our earlier commitment in the U.S. to have 80% of fiber-based consumer-facing packaging certified to the Sustainable Forestry Initiative Standard by the end of 2018. While our supply chains for Dunkin’ and Baskin-Robbins are complex and different in the U.S. and internationally, we strive to source all of our products as sustainably as possible. While Dunkin’ Brands is a relatively minor user of palm oil, we recognize the importance of sourcing palm oil sustainably. In 2014 Dunkin’ Brands created guidelines to share our commitment to sourcing responsibly produced palm oil, set forth clear requirements for our suppliers, and to guide our own decision-making regarding palm oil in our global supply chain, which we updated in 2017. You can read the guidelines here (link to statements and policies page). Since 2016, we have been working with the Rainforest Alliance, a recognized leader in sustainable supply chains, to assist us to revise and update our policy, as well as to strengthen our implementation capacity. As part of our work together we are undertaking significant investment to advance our policy implementation. Dunkin' Brands issues annual palm oil progress reports, which can be found here (link to statements and policies page). Our Sustainable Pulp and Paper Policy, which applies to our U.S. supply chain, details our commitment to ensuring we are sourcing pulp and paper that is traceable, respects Free, Prior and Informed Consent and does not threaten High Conservation Value Forests. We are also committed to including recycled and certified content in our packaging where possible. Currently, approximately 60% of our U.S. packaging is certified by the Sustainable Forestry Initiative (SFI). We are striving to increase that number to 80% by the end of 2018. For more information on our deforestation policies, please view our Guidelines for Sourcing Palm Oil and our Sustainable Pulp and Paper Policy. Dunkin’ Brands is committed to continuing to research and improve our Animal Welfare Policy based on advances in science and changing consumer concerns. We work closely with the Humane Society of the United States (HSUS) to understand NGOs’ and consumers’ expectations of QSR brands’ practices, and we have regular dialogue with our suppliers to understand what is feasible for our system from a logistics and cost perspective. In December 2015, we announced a commitment to source 100% of the eggs for our U.S. menu from cage-free sources by 2025. According to the Humane Society of the United States, Dunkin’ switch to 100% cage-free eggs will benefit approximately 1.4 million egg laying hens annually. In 2015, we also made a commitment to source gestation crate-free pork by the end of 2022. For more information, please view our Animal Welfare Policy. We believe in offering products containing certified ingredients when possible. We offer 100% Rainforest Alliance Certified™ espresso in the U.S. and select international markets, and our Dark Roast Coffee is 30% Rainforest Alliance Certified. We plan to transition our Dark Roast Coffee to 100% Rainforest Alliance Certified by the end of 2018. Since 2010, Dunkin’ Brands has provided the Rainforest Alliance with more than $350,000 in grants to improve the lives of smallholder coffee and tea farmers in Colombia, Ethiopia, Guatemala, India and Peru. In 2015 and 2016, we granted funds to the Rainforest Alliance for a two-year project providing technical support to smallholder farmers in Peru. Thanks to training on sustainable agriculture, water treatment best practices and use of mobile technology, almost 900 farmers are now trained in the Sustainable Agriculture Network (SAN) best practices and 580 new farms in our supply chain attained Rainforest Alliance Certified™ status and are now able to display the seal on their products. Our DD Green Achievement™ program, launched in 2014, is designed to help Dunkin’ franchisees build sustainable, energy-efficient restaurants in the U.S. DD Green Achievement restaurants are built with energy-efficient and sustainable elements, including LED lighting to reduce energy use, high-efficiency mechanical units, water reduction features such as low-flow faucets and more. There are now more than 190 DD Green Achievement restaurants around the country and we have set a goal to open 500 by 2020. Dunkin’ Brands also provides a range of tools for franchisees to maintain energy-efficient restaurants. For more information, please visit the DD Green Achievement page. 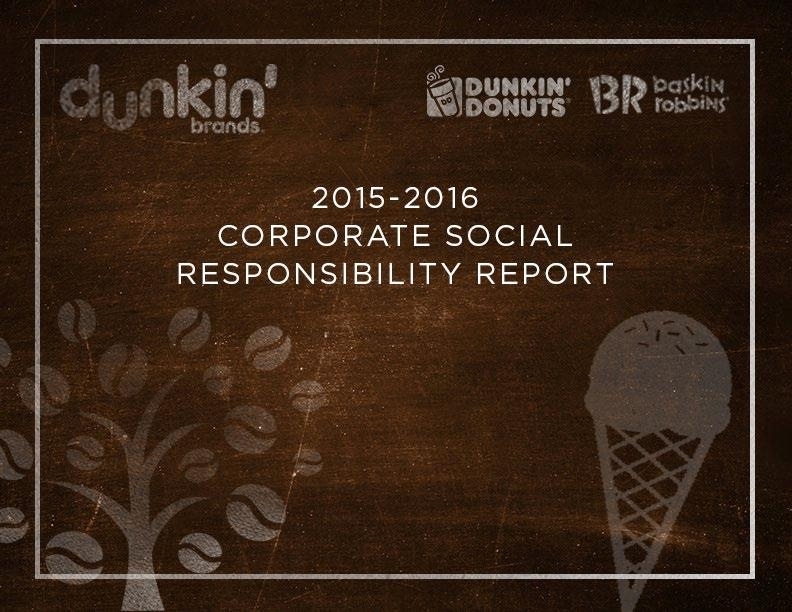 In our 2016 CSR Report, Dunkin’ Brands set energy reduction goals for our corporate facilities and corporate fleet for the first time. For our corporate facilities, we are committed to reduce energy use per square foot by 28%, compared to a 2013 baseline, by the end of 2020; and 30% by the end of 2025. For our corporate fleet, we are committed to increase fleet fuel efficiency by 9%, compared to a 2013 baseline, by the end of 2020; and 13% by the end of 2025. This follows the implementation of successful energy reduction strategies for our corporate holdings: Between 2010 and 2016, we saw a 35% drop in electricity use at our headquarters and a 19% reduction in heating use. Between 2010 and 2016, we saw a 57% drop in electricity use at our training facility, Dunkin’ Brands University, and a 34% reduction in heating use. For more detailed information about our sustainability strategy and goals, please visit pages 21-36 in our 2016 CSR Report.